It all ended last year on a rather sour note for Steven Wright, the Red Sox knuckleball pitcher. While finishing up his sprints before a game against the Marlins in the outfield he was hit in the back of the neck by a line drive. Results were bruised vertebrae and concussion symptoms that knocked him out for the season as they lingered on. With Spring Training kicking off, Rob Bradford caught up with Wright to ask about the offseason recovery. "It was massive headaches and it was always at the end of my workouts," explained Wright of what it was like. "They figured it was the muscles in my eyes that do the depth perception were working extra hard, and that what was causing the headaches. Even though my vision was fine, my eyes were working extra hard to do what I normally would do. The headaches were miserable, just piercing-type migraine headaches every day." That is all behind him now and he is faced with a new headache, that of making the major league roster as he is out of minor league options. Not only that, there seems to be no place on the starting rotation and bullpen spots will also be at a premium. Wright has shown big league value both in long relief and as a starting pitcher, so the Red Sox will be tested in how much they value their knuckleballer. When asked if he is worried about being out of options he simply said, "To me, no, because my biggest focus is on what I can control." "If I can keep it that simple, than everything else works out for itself. We obviously have a great group of guys, we have a lot of talent that was brought in and we have a lot of talent that has been here. For me, I don’t think about that, because I’m still trying to prove myself. If I can just stay under control and not do too much I think that’s when I get in trouble baseball-wise. I over-think things and I try to force things. It’s the knuckleball. As long as I can prepare myself and put myself in a situation to make a good pitch, more times than not I’ll be OK."
So what is the focus at Spring Training for Wright? "Coming into camp, I just want to do whatever the team needs me to go. Right now there are no spots in the rotation, which is fine for me because I don’t ever want to seclude myself to one specific role because I know I can do everything. I’ve done it all, so I might as well continue to try and do it." One can see that Wright is relaxed and full of energy within the pitching squad. 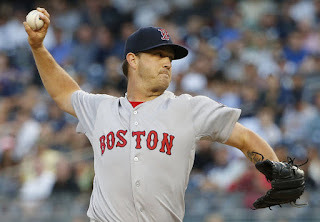 It would seem that with the season starting the Red Sox would want Wright in their bullpen for a number of reasons. He has a proven ability to start major league games, posting a 3.96 ERA over nine starts last season. Over his total of 26 major league games he has totaled a career 3.95 ERA. Wright likes his chances and feels that experience makes a difference. "There’s just a little more understanding of what it takes," he said. "You've been there, so there’s not as many surprises. You understand what it’s like to be on a mound when you have 50,000 people, and you’ve got TV. You know it’s there now, but it’s either to kind of forget about that stuff and focus on what you can do. It was one of the hardest things for me. You so caught up in the fans, the media, the TV, the players, the field and the whole life of being there, you forget the one thing that you still have to play the game. I think it will make it easier to be able to concentrate on what I have to do on the mound to help put myself in position to make a quality pitch, vs. getting caught up in everything else. That’s just experience, and that’s one thing you can’t teach. I’ve been lucky to have the experience for the last three years, so hopefully that not only helps in spring training but to go on for the whole season." It would be a crime to lose the knuckleball at Fenway Park and with Wright seemingly entering the golden years of tossing the knuckleball we would expect not to be disappointed in the 2016 season.